Welcome to our ongoing Game In Progress coverage of Torment: Tides Of Numenera. Over the next several weeks, William Hughes will be making his way through InXile’s ambitious sequel to cult-classic RPG Planescape Torment and occasionally reporting in to review what he’s seen. This first installment covers his experience with the game’s first 10 hours. As always, we invite you to play and comment along as he dives into this dark, dense journey. Moody, imaginative, and literary, Planescape Torment was a take on role-playing games that put far more weight on moral choices and conversation than statistics and magical equipment. Containing multiple novels worth of dialogue and description, Black Isle’s 1999 masterpiece took one of gaming’s most diverse and creative settings—Dungeons & Dragons’ Planescape, a multiverse of sentient streets, lying angels, and confused metal men—and tied it to a personal story of identity and regret. 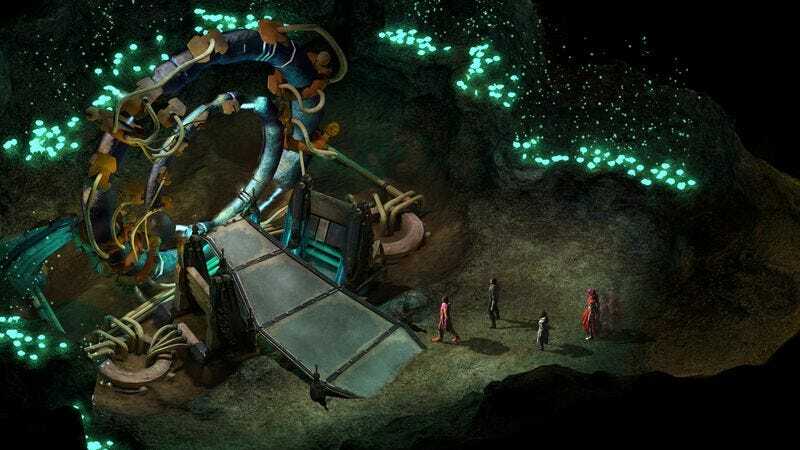 It goes without saying, then, that InXile Entertainment’s spiritual sequel, Torment: Tides Of Numenera, has some big shoes to fill. Set in a futuristic world where nano-machines reshape reality and enigmatic deities wage secretive wars with their own castoff selves, InXile’s game, written and designed in part by Black Isle vets, hopes to live up to one of the best-told stories in gaming history. From what we’ve seen so far, it largely carries that weight. Torment quickly lays out its basic premise. You are a castoff husk of The Changing God, an enigmatic, immensely powerful renaissance man with the ability to move his consciousness into freshly grown bodies while the discarded past shells take on a more limited life of their own. Surviving your initial plummet, you’re quickly introduced to the vertiginous city of Sagus Cliffs and The Sorrow, a mysterious being that’s hunting the Changing God and his recycled children in the real world and within the labyrinths of their own minds. That labyrinth isn’t strictly metaphorical. As in Planescape, death in Torment isn’t permanent. Instead, it sends The Last Castoff (as you’re known) into a mental landscape that serves as a hub where they consult with past lives, go on miniature vision quests, and battle off the lingering tendrils of the Sorrow that seek to lodge themselves in their memories. Fighting off these squid-like specters is handled the same way as every struggle in Torment: the manipulation and expenditure of the players’ Might, Speed, and Intellect pools. With its focus on in-depth conversations, Torment occasionally resembles a visual novel or a choose-your-own-adventure game more than a traditional RPG. But the allocation of these three resources, which can be spent to increase the success rate of a corresponding action, is where the game finds room to turn the screws on the player and force them to think tactically about their choices both in combat and out. Do you spend your Intellect arguing a fellow castoff into supporting your cause or save it to power your psychic attacks the next time a rogue combat drone tries to cut out your brain? Empower a critical strike on an enemy by burning all your Speed or save it to sneak a vital key off someone’s belt? The most reliable way to recover these pools is to sleep, but that carries its own perils, as it advances the in-game clock. Sleep off a rough bout of exploration in the middle of a murder investigation, and you might wake to find that a character you’d just been chatting with has become the killer’s next victim. As a result, conversations feel as weighty and full of danger as fights, and it drives home a central moral: Your choices matter. Knowing you’re willingly giving up future success to save your own skin in the moment can make unleashing an overpowered attack mid-battle feel both empowering and perilous. You won’t necessarily be fighting often, though. Out of the 23 quests attempted or completed for this week’s entry of our Game In Progress review (a stretch representing roughly 10 hours), only three involved mandatory combat, and even then, there were usually ways to manipulate the battlefield or talk opponents down. That should come as a relief for anybody hoping to coast through the game on a mixture of intimidation, inquisitiveness, and charm, even if it does present a few moments of extreme frustration when the knives and science grenades are eventually forced into the open. Even if you know it’s your fault, it’s still a pain to get taken down in the first few rounds of a crisis because you’re playing through the game as a smooth-talking mechanical genius, not a battle-hardened warrior. Those difficulties are exacerbated by Torment’s status as the rare role-playing game that lets you choose to recruit a powerless 11-year-old girl into your party in lieu of a physically imposing assassin or multi-dimensional wizard. Said tween companion—Rhin—is one of what is, so far, a surprisingly lackluster selection of accompanying teammates. Despite her ability to talk to “gods” (i.e., rocks), all Rhin can do in a fight is run and hide, while the rest of your party, rounded out by a former monk with Changing God-induced PTSD and a guy who’s basically Han Solo, handle the rest. But Rhin is also sweetly charming, steeped in mystery, and capable of inflicting a pretty gnarly guilt trip if you ask her to leave, so in the party she may very well stay. It’s not that the rest of the games’ party members are offensively flat, so much as they are unrevealed. We’ll presumably get more out of them after we leave Sagus Cliffs behind for the Valley Of Dead Heroes. But gods, what a place to leave! Torment is going to live and die on the strength of its writing, and this first section puts its best foot forward with a bold and aggressive kick to the head. Even the first area you reach after clearing the tutorial is packed with imaginative scenarios and intriguing characters, each carrying with it pages of dialogue and, often, an accompanying quest or two. The end result is an occasionally overwhelming feeling of density—and a worry that the game can’t possibly keep up this pace. It remains to be seen whether Torment is front-loaded or just loaded, but Sagus Cliffs is an incredible mission statement of its literary goals. The writing is uniformly good and the characters capture a number of tones and voices, from cheerfully arrogant robots to alien beings whose dialogue is just barely comprehensible as human speech. Clicking on a new character is like dipping into a rich short story, as they lay out their weird internal rules and philosophies. It’s even better if you take the skill that lets you read minds, a welcome crib from the Divinity games. Meanwhile, your choices are reflected in the dwindling of those stat pools and the innovative Tides system, which forgoes more traditional moral alignment by focusing on one of five “moods” a given action corresponds to. The game hints that the Tides will be more important as it goes on, but for now, they’re mostly used to empower the occasional effective but self-destructive Tidal Burst ability that lets you impose on people’s minds or unlock dormant skills. Outside self-inflicted crippling of a player’s combat abilities, the only other major sin resting on Torment’s slate is stability. One quest was so bugged in our review copy that I was forced to abandon it, while another automatically completed in an irritating, effort-ignoring way. Bugs, which InXile is reportedly racing to fix with a day-one patch, are frustrating in any game, but when you’re digging into a rich novel like this one, it can easily shatter the illusion and sense of comfort that makes it a story worth playing. Despite that, Sagus Cliffs remains a stellar introduction to the world of Torment, hinting at any number of coming reveals about the Changing God, the Sorrow, and your relationship to them both. It also provides an amazing breadth of experiences. One minute, you’re wandering into a bar only to find it’s operated by a retired troupe of psychic veterans who need help with one last job, and the next, you’re comparing testimonies between members of a corpse-devouring cannibal cult or even letting their members feast on your regenerating flesh to gain new insights into your castoff condition. If Torment can keep up this pace of interesting challenges and fascinating stories, it might just prove itself as a successor to Planescape Torment in more than merely name. Purchase Torment: Tides Of Numenera here, which helps support The A.V. Club. Unsurprisingly, Tides Of Numenera is absolutely packed with references to Planescape Torment. The most obvious ones include the fact that at least some of the city’s residents used to know you as Adahn (a possible fake name The Nameless One could use in the earlier game) and the presence of the interdimensional traveler O in one of the city’s bars. There’s some real elegance going on with the game’s quest design, too, especially with the ways your companions will react to certain events. The most notable was one quest that only slowly comes into focus near the chapter’s end and retroactively explains a great many odd things going on in the city, while also reflecting on the Changing Gods’ more human motivations.